It’s curious how the mind works… we can overthink a situation or a problem and tie ourselves up in emotional knots, getting stressed or overwrought …. yet when we finally allow ourselves to feel the rhythm of life and go with the flow of nature’s wisdom, we can blossom. Perhaps it would be wise to take note of the wisdom of nature and connect with the subconscious mind and begin to acknowledge our innermost dreams. A flower doesn’t evade its life purpose or procrastinate when the time comes to blossom. It doesn’t seek approval from outside itself…. it takes time to form a bud and then opens up and flowers. Occasionally there are adverse conditions which may cause it to be vulnerable, but this is a strength…..
Be the gentle gardener of your soul and connect to the universal energy that surrounds us, acknowledge your journey thus far, recognise your self worth, knowledge and open to amazing opportunities as you blossom…….. I was curious about what time the New Moon energy was coming in, so on the trip up to the retreat, I checked the Moon Phase app on my phone (& no, I wasn’t driving at the time). It was the 15th at 11.19am….. I checked the clock and it was 11.19am….. an auspicious start to the weekend with such a synchronicity! Arriving at the retreat it was apparent that not much rain had fallen over the last 2 weeks, so the small tanks had not yet refilled. In the quest to fill the main concrete tank since the repair, which seems to have held up, we empty the smaller tanks into it on a regular basis in the hope that we won’t have to buy water over next summer. Every little bit helps. With no major projects scheduled for this visit, I found a spot out of the breeze and sat down to write my new moon manifestation journal. As I meditated, I became more aware of the birdlife and occasionally could hear a ruffle of tiny feathers and catch a glimpse of the robin family as they went about their daily activities. Having completed my page, I made my way to the labyrinth, where it was pleasing to see no more digging by the local rabbit and the rose bush was relatively OK. A little frost burn on the top shoot, but some fat and healthy buds lower down. Hard to say what the Oak tree is doing as all the others are looking very dormant too. The two wattle trees in the labyrinth are just about to burst into bloom and one has some interesting galls on it. Love the pattern of the budded flower, reminding me of the Fibonacci numbers! The yellow wattles surrounding the labyrinth had a quiet hum as the bees made the best of the pollen. This walk was slower than usual, focusing on each ring and visualizing the chakra colours as I progressed. Every so often, time to pause and move a stone on the path into the channel or small ditch that defines the outline. Reaching the centre, I re-read the journal entry, slowly tore it into strips and then lit it, allowing the paper ash to be caught in the gentle breeze, carrying my words and pictures away. As I watched, I made the conscious intention to let go and let the universe take care of my requests. Meditating in the centre, I was startled by the bang of a shed door on the neighbouring property. What seemed like an instant later, a large kangaroo burst out of the surrounding wattles into the space in front of the labyrinth, followed by a couple of smaller roos and 2 joeys. They paused…. I paused…. The larger kangaroos hopped off, leaving the little ones no further than 3 metres away and we looked at each other for a few more seconds…. an amazing moment ….then they were gone. Next morning I went for a walk in the “Wild area” and found a spot which I think might be suitable for a “secret” labyrinth. It’s close to a rocky outcrop, so not far to move some stones to outline it. Perhaps a small 3 ring Cretan style labyrinth…… I’ve already got sites in mind for a big 30m Chartres style and a Celtic style triskele walk. A family of rabbits has moved into the area and have been engaged in some major earthworks in and around the labyrinth, the last few months. No warren sighted yet, but I’m keeping a look out. However the earthworks in the photo are of my doing! The Oak tree which showed great promise before being munched down a couple of times was moved over the weekend to stand at the entrance to the labyrinth and a rose bush has been installed in the centre. Hopefully the thorns will deter the animals, but next trip I will put up some wire to keep it safe. With the recent rains and the previous application of gypsum, the soil is much easier to dig now and two large holes were prepar ed with compost for the plants. I also took the opportunity to redefine the outlines, removing all traces of the holes that the rabbits made digging out the sage and the garlic plants. Eventually, there will be something that is not palatable for them. Perhaps they enjoy something a little more exotic than the lush green grass that is starting to sprout! Another refurbishment of sorts happened with the toilet system. A “wee diverter ” arrived and a new toilet was built for me, with the wee now diverted into a pit filled with rocks and ant sand. As with all projects, nothing is simple although the finished toilet is practical and “throne like”. Lucky we are tall and there is a small platform or step being built for shorter people who might visit. The kit came with the diverter and a polystyrene seat and lid – a little different to the standard toilet seat, but nice for winter! Buckets are sourced from the local takeaway shop in the city and the sawdust from the local sawmill in Rushworth. Permanent marker is not so permanent in the hot summer sunshine and tags made from aluminum cans with the dates scratched in are attached to the handles. The buckets are sealed for a minimum of 12 months before being used as a soil improver for the ornamental (deciduous) trees that I have been planting. Collecting seeds is now one of my interests and there’s a shed full of empty pots to start another forest. Currently I’m waiting to see if another 3 oaks have germinated, and have some seed trays with Japanese Maple seeds in them. Just recently, I gathered some Sheoak seeds and they are ready to plant. Peppercorns have been sown directly into the soil along a fence line and it will be interesting to see what happens with them. I have asked for some nuts from a friend whose mother has a small orchard, but am thinking that the cockatoos will decimate them. Next major project is to mend the horizontal fence. More than a dozen of the old wooden posts have either rotted or been knocked down by kangaroos on their travels and along the length of the the fence is the local phone line. With more than half a kilometre of fence to repair, at this stage ….while the ground is soft… I’m going to get a dozen or so star pickets and put them alongside the fallen posts and wire the fencing to them. At least that will give the illusion of an upright fence! I don’t profess to be a skilled Tarot card reader, but on occasion when I bump into a conundrum, I will shuffle the pack and deal out a card. If I have the time, I will do a full spread and consult the books and my intuition about what has been revealed. Justice was the card that came out today. It’s all about fairness, truth and karma. Quite fitting, considering the situation I was asking about. The balanced scales held in the left, or feminine hand, can represent spiritual balance and intuition. The right hand and masculine hand, holds a double edged sword , representing logic. Justice has to balance that logic and intuition, remain impartial and choose a course of action with full awareness. 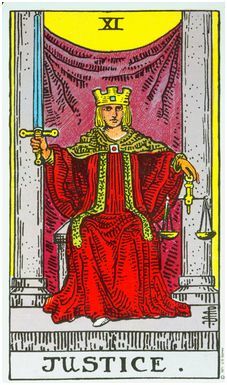 This card is about whether you have acted in fairness, truth or honesty. Have you tipped the scales of justice affecting your karma? If you have been unfair, untruthful or dishonest in your dealings, then this is a warning to change your ways. It’s about being accountable for your actions and making sure that you act in a fair and just manner. So this card can then be a “call to action” in so many ways, reminding us to be even handed and balanced in our dealings with others. Am I procrastinating about what should be done….. the right action? Is my work life balance or my logic intuition balance OK? Am I taking full responsibility for my actions…..past, present and future? This card tells me that I need to rely more on my intuition, particularly in regards to working with others who may not have the same values of fairness, integrity or honesty. The card shows me that I must take responsibility for my actions and accept the lessons learned when dishonesty appears in my day. Moving on from the experience is part of the journey, as is accepting the karma as a result of the actions.